Yep. My mind has officially been blown. 1. The people who did this trip were George Pillsbury and Mary Boyden Pillsbury. And who was I named after? Mary Boyden herself. I never liked the name because I had no connection to Mary, but boy do I now! 2. George and Mary traveled to Japan, Hong Kong, and China, among other places, which happen to also be our first stops on our big adventure! 3. They arrived in Japan on April 7, 1911. We'll be arriving in Japan on April 6, 2013. 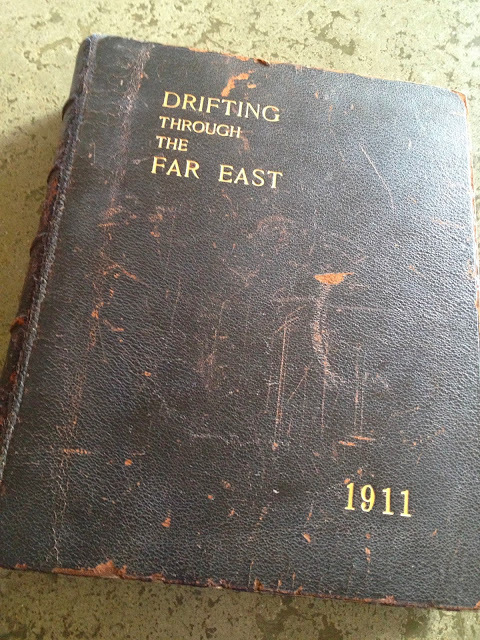 The following pages have been written both as a labor of love and a most delightful renewing of the experiences and pleasures we (my wife and I) enjoyed, while drifting through the Far East in an absolutely irresponsible and carefree way. We made no effort to "study the people" - their history was to us an uncut book - their politics concerned us not at all. 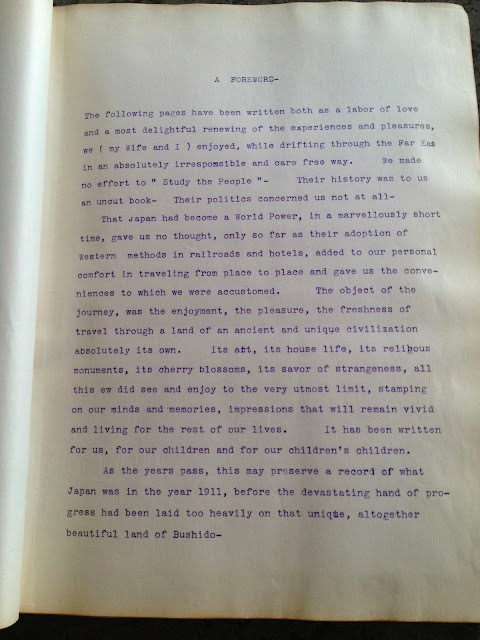 That Japan had become a World Power, in a marvellously short time, gave us no thought, only so far as their adoption of western methods in railroads and hotels, added to our personal comfort in traveling from place to place and gave us the conveniences to which we were accustomed. The object of the journey was the enjoyment, the pleasure, the freshness of travel through a land of ancient and unique civilization absolutely its own. Its art, its house life, its religious monuments, its cherry blossoms, its savor of strangeness, all this we did see and enjoy to the very utmost limit, stamping on our minds and memories, impressions that will remain vivid and living for the rest of our lives. It has been written for us, for our children and for our children's children. As the years pass, this may preserve a record of what Japan was in the year 1911, before the devastating hand of progress had been laid too heavily on that unique, altogether beautiful land of Bushido. The only challenge with this mind boggling traverse along my ancestor's path is attempting to convey our experiences through this blog with as much fabulous language as George and Mary conveyed theirs. I hope our blog finds its way to our children's children's children's children as well! [From Christmas unti we left], we lived in a constant fever of anticipation and preparation for, to us, a most outstanding voyage.